Forsythia are one of the most commonly-grown shrubs in the home garden – and one of the most abused. Many homeowners buy a forsythia dreaming about the bright yellow flowers that appear early in spring. So you plant it near a window, door, or walkway where you’ll be able to easily see it in full bloom. Three years later it’s a 10-foot monster that’s blocking your view and making you detour around it to get inside. Although there are a few smaller varieties of forsythia, most forsythia shrubs have a naturally vase-shaped form and grow to about 10 feet tall and wide. That’s a big shrub! Far bigger than the space most of us give it. The end result is the need for a drastic pruning job – one that often looks more like butchery. So how do you keep your forsythia in-bounds without making it look like a meatball or a mess of flowerless stems? There are two approaches to pruning forsythia, depending on what state it’s in. If it’s an overgrown mess or far too large for the space then cut the whole thing down to just above the ground. That’s right – whack it to the ground. 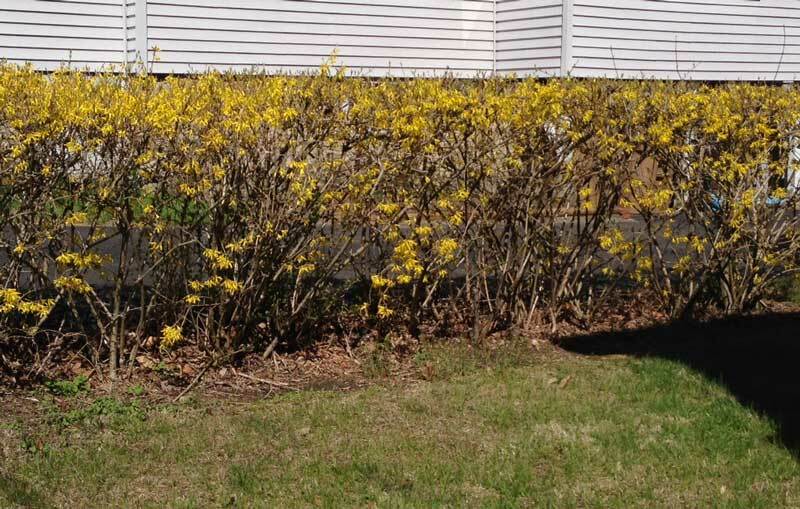 Forsythia are vigorous shrubs that quickly bounce back from this type of rejuvenation pruning (provided that the shrub is healthy to start with). Keep in mind that forsythia are large shrubs so even with rejuvenation pruning you’re likely to quickly end up back where you started; they can grow 8 feet stems in a single season! If you want to manage the overall shape or clean up the shrub a bit then you’ll want to do some thinning. This involves cutting between ¼ and 1/3 of the oldest stems to the ground; do this every year. Focus on stems that are damaged, trailing on the ground, crossing, or look out of place. Be sure to always take a few of the larger stems out of the center of the shrub. This makes room for new growth and allows sunlight into middle of the forsythia so that it can put out leaves and flowers all over the shrub, rather than just at the tips of the branches. Whatever you do, do not simply cut off the tips of the branches or lop them off part way down the stem. Forsythia respond to that type of pruning by putting out tons of new growth just below the cut. You’ll end up with a snarled mass of branches with flowers only at the branch tips and an even larger shrub. Some people use forsythia as a hedge and keep it closely clipped (essentially they’re cutting off the branch tips). While I don’t recommend this (there are other shrubs that make much better hedges), this approach can work. Forsythia shrubs pruned this way have very few flowers, the interior of the hedge has only thin, tangled branches (no leaves), and they need to be sheared several times a year to keep them looking somewhat tidy. But if this appeals to you then use hedge shears or an electric hedge trimmer three or four times during the growing season whenever the shrub starts to look overgrown. This forsythia hedge produces very few flowers and not many leaves, making it look scraggly all year long. The timing of your pruning depends on what you’re trying to accomplish. The usual advice is to prune after the shrub blooms in early spring. Forsythia bloom on stems that formed flower buds the previous year (called “old wood”) so if you prune before it’s flowered then you won’t have any flowers that year. If you’ve been pruning the shrub regularly and it’s in good shape then go ahead and prune after flowering. But if, like many of us, your forsythia needs a little more work, then it’s best to prune it before it flowers. For rejuvenation pruning or if you’re trying to reduce the overall size of the shrub, it’s best to make your pruning cuts in late winter or early spring when the forsythia is still dormant. Yes, this will sacrifice some of the spring-time blooms. But you’ll be able to easily see the structure of the plant to determine which stems to remove. Forsythia are such leafy shrubs that it’s difficult to see what you’re doing after all the leaves are grown.